Looking for A Simpler Way to Swing? Are you confused by golf instruction? Are you looking for a simple way to hit a golf ball? Listen, I’ve been where you are now. Confused, lost, frustrated and tempted to give up golf for some other sport that will actually be FUN to play. There are quite literally thousands of conventional golf methods out there and each one of them is extremely confusing. Watching tour players on TV hoping to catch a trick or two is just as confusing. Why is this so hard? I mean, all we are doing is swinging a metal stick at a stationary ball. It was only when I broken down the mechanics of swinging a golf club that I discovered the secret. And it was after watching this man that it suddenly became so clear. There is no easier way than the Single Plane golf swing of Moe Norman. Moe Norman Simplified golf by intuitively discovering a golf swing that returns the club to impact with the least amount of moving effort and the maximum amount of efficiency. Look for yourself at Moe Norman’s swing and my golf swing. From the DTL view, you see that the club starts, swings and impacts on the Single Plane. Looking closely at these mechanics, you can see the bio-mechanically perfect body positions of the single plane swing as well as the perfect Single Plane club movement. From a face on view, you can see the efficiency of the body movement beginning with the simple straight line of the clubshaft and lead arm at address. From there you can see the proficient movement of the shoulders and the leverage position at the top of the swing. The downswing returns the club and the straight-line lead arm and clubshaft once again at impact and the release shows a powerful extension through the golf ball. Moe Norman’s golf swing simplified my golf swing and helped me become a better golfer. Even more important, I can actually enjoy this game again. So you have a choice. Are you ready to have a game so consistent that you blow away your buddies on the course EVERY time you play? Are you ready to be the best player you can be? Golf really is a SIMPLE Game…When you have the right secret! Let me help you learn the Single Plane Golf Swing of Moe Norman. Let me show you how to have fun again on the golf course. Enter your name and email address here on this page and I’ll send you the first step on your journey to great, simple golf. Please send free first step to simple golf. Looking forward to learning more about the single plane swing. Make sure your stance is not too wide… Also make sure you are not reverse pivoting (or too much shift to the trail side) in the backswing. With a good set up and proper stance width should be no problem getting back to the ball for solid impact. I am confused about the ball position. In the last two pictures of your illustration your ball is inside your left heel. His is several inches outside his left foot. Inside the left heel is where the ball is normally played with a Driver. Anything forward of that is too far forward for most driver lofts. Moe would occasionally play the ball more forward but he often had a 7 degree driver when doing so. Inside left heel is best. do you still like the right foot in closed position with longer clubs. Just slightly closed with longer clubs. I’ve always been told I have a very good stroke, but I have always battled with a condition that currently has me ready to give up golf for good. For whatever reason, I struggle, especially with my irons, and doing a full release of my wrists at impact, which results in an open club face, and low (no more than 10 feet off the ground) missiles directly right (I am right handed). When bad, it’s everyone one of my irons, and even mutates to short chip shots. It is beyond frustrating, and I’ve already left a round early because it is no longer golf. I’m usually not plagued by this with my woods, although my consistency there can also improve. I am capable of driving 275+, and and hitting my 7 iron 175, but my open clubface dilemma is killing my desire. Will the single plane system help to eliminate all my issues with my wrist release, or lack there of? I would love to find a repeatable swing, that is not as prone to falling apart during a round and screwing me up for a month, battling with this. Thanks in advance! I suggest shortening the backswing and leading more with the hands into impact. This will eliminate the early release. Also – make sure you shorten the backswing more than you think. Exaggerate it and see what happens. Let me know. The key is actually turning the right side into a flexed lead knee. Can you turn your right side into impact? I ALSO SENT IN THE GOLF CLUBS ONLINE FITTING INFO AS WELL. MY GAME IS VERY INCONSISTENT AND DOESN’T LOOK LIKE IT IS GETTING ANY BETTER. I HAVE ONLY PLAYED A SHORT TIME AND WOULD LIKE TO MAKE THE GAME MORE FUN TO PLAY. I THINK MOE NORMANS SWING CAN MAKE THAT HAPPEN. Watched videos and tried to review today, but could not access. Hi Len, call Support at (866) 377-2316. Tanya would be glad to help you out! I often realize and feel that my arms and shoulder are disconnected from backswing into impact, resulting in poor contact. Does gluing (always connecting my left arm and chest) during entire backswing and downswing is a good way? Or what is a good drill for this. Hi Todd, when you or Moe are shown from a face on camera view ( w/ Driver ) the club head is positioned 6″ – 10″ behind the ball and the yellow line is drawn illustrating the straight line down the left arm and shaft to the ball. In your DVD set it is mentioned that by extending your arms this way at address that your are starting with the impact position. Since the ball is 6″-10″ ahead I am confused by establishing the impact position BEFORE the ball. It seems like it could result in an early release and not a flat left wrist ( I am right handed ). What am I misunderstanding? What lie angle did Moe or your players have to use in their irons? When I set up this way with my clubs it looks like I need a much more upright lie. Hi, I purchased a set of irons back when it was called Natural Golf that came with the black Natural Golf grips. I’d like to purchase some grips for my woods, how do the ones you sell compare to the older grips are they basically the same? They appear to be more tapered from the pics. The key is to get the club on plane (path). You need to fix you swing path. Probably flatten out a bit. Could you clarify what direction the knees should go for the buckle move at the start of the downswing? Initially the instruction indicates a move to the target but after the pictures the practice activity indicates to move to the toes. Maybe it’s some combo of the two? Yes. The knees flex toward the toes as the body moves forward so it is both toward the toes and toward the target. I have been a fan of Moe for a long time. Just started to implement the 1P swing recently with very promising results. I probably had the incorrect impression that once the back swing was completed on plane you could just swing away. Having watched a few more videos Its now seems to me that that on completion of the back swing the club is parallel but slightly above the setup/impact plane hence the need for the Vertical drop. Is the close to correct ? I purchased the DVD’s and seem to be hitting it ok, when I get to the longer irons 4-6 I seem to error with a hook or pull hook. What would cause this? Check your lead hand grip. Might be too strong. I am right handed and I find that I keep pulling the ball to the left and I cant figure out the cause. Could be your lead hand grip too strong. The Single Plane Swing recommends a neutral lead hand grip. Anything you can teach me will be an improvement. My name is Maz Farina from Beacon Falls Ct.,three years ago i bought a set of pings irons and took them home and went out to play with them i couldnt hit the 8 iron more then 100 yards and everything went to hell from there i must have spent 4,000 dollars taking lessons from different pro’s and the swing got worst, so i quit playing. I haven’t play in the last 3 years.Tood let me tell you this I’ve been a bowler all my life joining the PBA in 1990 I’ve never quit anything in my life but golf i did. Couldn’t understand why my swing got so bad. Ive been dying to play again but every time i go to hit balls with that 8 iron i can’t reach the 100 yard flag. So I receive an email last week about Moes single plane swing so i took my 3 year old grandson who love to hit balls and it took me about 5 swings to figure out where to stand and i hit 20 balls with my 8 iron and hit it at 150 yard flag so i so excited. I wanted to tell you that when spring comes i will buy your tapes so i can learn more about Moes swing and i thank you for making golf exceided again for me. Great Maz. Thanks for the note. Let us know if we can help. At set up, 45 degree tilt and a slight tilt with left shoulder closed to the target a little and the right shoulder lower than the left at address, forming the tilted “V” with the arms: Do I need to feel like I am squeezing my upper arms into my body and intentionally keep my trail arm close to my body back and through the swing? When I do what I have described I make better contact and more solid contact, it this correct? I don’t want to develop a habit that is not correct. If you call 866-377-2316, you can receive a discount running right now. Do you still sell the “square” putter grip? If so, how can I get one? Thanks for this offer and video. I have just started playing golf and am lucky that I found this technique right off the bat. Any help from you would be most appreciated. …62 year old male with mid to lower back issues…arthritic right knee with mild body flexibility..,I need simple repeatable golf swing to hit the ball more consistant and solid…help!!! Sounds very typical of many of our students. The single plane swing of Moe Norman is recommended as it has been show to ease the stress on the back compared to other traditional / conventional swing methods. Do you recommend shoulder tilting the 20 degrees before putting your trail hand under the club to make it easier? On the address is your lead hip bumped forward due to 20 degree tilt or slight hip turn in or both? How much turn of hip and shoulder in at address? is the transition compatible to skipping a rock under hand? The 20* shoulder tilt is due to putting the trail hand on the club and the hands leading (pointing toward the pivot point). Do not do before you put the hands on the club. Hips are bumped slightly forward due to the shoulder tilt and slight hip turn. The is minimal hip and shoulder turn at address. The shoulders will look / feel slightly closed because your lead arm is higher than your trail arm at set up. The feel of impact through release (of the trail hand) is comparable to skipping a rock (in feeling). Does Conventional golf have a 20 degree tilt? It seems Moe had more tilt. I’m a member of the online coaching program with Mr. Farnsworth. What is the best way to communicate with him when I have questions about anything? Can I ask question through the V1 app video or email? Clay@Pga.com is the best way to contact Clay directly. Heard about your website and the single plain golf swing from a friend. Want to check out the materials. I have read much of what you have written advocating the “Moe Norman Swing,” and I agree that numerous golfing legends have repeatedly praised Moe’s ball striking ability. However, I am at a loss to identify a single top player, even a single tour player past present or future who uses the Moe Norman Swing, or anything close to it. My concern is that Moe was a one-of-a-kind and his swing does not readily transfer to everyone else. 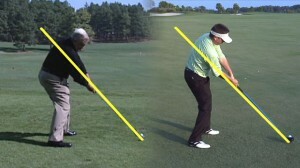 Golfers like Trevino and Palmer had swings that worked for them, but nobody is copying those swings with any success. After all, if the only reason Moe’s brilliant swing didn’t dominate the golf world in his time is Moe’s personality quirks, why can’t another athlete study his methods and at least make a living on the pro tour? Aside from the success stories of average, or even low handicap golfers, which are virtually impossible to verify (I have played with hundreds, if not thousands of different golfers and never played with someone who uses the Moe Norman swing), are there any examples of the Moe Norman swing among the upper echelons of professional or amateur golf anywhere? Then you haven’t seen Steve Stricker swing. One thing to consider is that it is not always a mental problem. It means that you have not repeated the correct movement enough whether it be with a ball or without a ball. One challenge that we give to our students is to make 100 correct swings each day to engrain a new habit. Also, you have to have some kind of feedback to know that you are doing the movement correctly whether it be swinging in front of a mirror or videoing yourself with a camera/smartphone. A great tool/product we have is our coaching program that allows people to send in videos of their swings so that us GGA coaches can analyze them and give you feedback on the areas that you should be working on. We would love to see a swing without a golf ball and one with a golf ball and be able to see what is going on differently. want to learn the single plane golf swing. i am at my wits end and ready to give up the game. my old swing and game is not enjoyable and i am ready to learn the single plane swing. this is what I have been looking for to finally break 100! We live in central, NJ. Where can we take local lessons? I understand that the game is frustrating at times because you aren’t as consistent as you would like to be. Let me ask you a question though, do you know what you are doing wrong? Do you have a way to continually get better? Those are some questions I would like you to ask yourself and if the answer is no, then why can you be frustrated with yourself? We have a great tool/product that can guarantee you improvement and it is our coaching program and gives you the ability to send us in videos of your swing so that we can analyze and give you things to work on. Mainly, so you can improve. That is great to hear! We would love to see you at a school in the future or if you are interested in further help with your swing to get involved in our coaching program. The body does not move out of the way in our method. The lower body stabilization is what allows the upper body to produce the speed. in the downswing, the lead hip starts and then gets stable, then the hips rotate down and forward and the upper body follows with torso rotation which brings the arms and hands to the ball. Moe felt his hands very quiet in the swing and he was using the bigger muscles to produce a consistent, powerful movement. First let me say that after many years of the conventional swing I am in process of learning and switching to the single plane swing and while it is early stages my ball striking is greatly improved ( I was a 10 HDCP but it’s gonna drop using this swing). I find online coaching invaluable and will be attending a school next month so thank you for the great resources. My question is, on the site Steve Stricker is used as an example of a tour player who closely matched the model, but what about this young fellow Bryson Dechambeau? He seems to REALLY match the model and he’s the NCAA and US am champ. What do you think of his swing vs the model and do you know if was taught by someone with at least some understanding of the single plane conceptsor did he discover the swing by dumb luck trial and error. One thing that you will find after attending the school that you are coming to next month is that the online coaching is very valuable and rewarding. Once you get the hands on treatment from the GGA Instructors, you will have a good understanding of what you are looking for and getting feedback after your school is the most important to insure consistent improvement. Bryson DeChambeau has a great single plane swing and he studied the body and how it moves and realized that it was the simplest and most efficient way to swing. He is a physics major as well. The only difference between Moe and Bryson is that Bryson stands closer to the golf ball, which makes him more upright with his spine. Also, all of his irons are the same length and it took him a long time to figure out the correct weighting of each club so that they went the proper distances. It is very cool what he has done. I went from a 17 handicap to 20 handicap in 4 weeks. While enjoying getting out and playing I was frustrated at not scoring. I saw the SPS on Facebook and checked it out and ended up purchasing the DVDs. I have played 3 rounds using the SPS and, 1st round, played to handicap, 2nd round, 42 stableford points and won, 3rd round 44 stableford points and won. I am still getting used to the swing, but the success I am having is making the game enjoyable. Do you know of anyone in Sydney Australia who teaches SPS, so I can tune up when I need to. That is great to hear about such quick success and improvement! Unfortunately, we do not have any instructors in Australia right now, however, it is a place where we are looking into for the future. Your best options right now, in regards to getting instruction, are to either come to one of our schools in the U.S. or get involved with our Coaching Program. The Coaching Program is a tremendous tool that allows you to send us in Videos of your swing and we give you feedback and things to work on to make sure that you continuously improve. Unfortunately I don’t think the Mrs will let me fly over to the States for a golf clinic! Although I would love too. I seriously think you have an opportunity down under. I was explaining the concept of SPS to one of my business partners who is a keen golfer. He is having a trackman lesson on the weekend, which I have had. We have serious golfers down here as we are very competitive people, while a small market compared to the US, we are a nation of sports man and women and we punch above our weight internationally. Vey few pros I’ve had lessons from can communicate the fundamentals. Your program is easy to understand. Thank you for the links I will definitely use them when time permits. If you would like further information on the Single Plane Swing, you want to look into becoming a member of the Single Plane Academy on our website. This will allow you to view all the material about the swing and view an abundance of videos explaining the method. Glad to hear that it caught your attention! We would enjoy seeing you at a school in the future! I have had some good rounds using the single plane swing, but lately every shot I take right seems to be going left. It’s not hooking, it is going straight left. So I’m always way to far left of my target. Can you tell me what is causing me to do that? Please send me information on the single plane swing. Hi, this looks interesting and Im at the end of my rope with all the swing plane stuff! Our website has all the information you need about the Single Plane Swing and all the different Programs we have. We have 3 and 5 Day Schools around the country that feature Tim and Todd Graves, we have our Coaching Program that allows you to send us in videos of your swing and our Instructors analyze the videos and send you back a detailed analysis, we also have certified instructors around the country that do package deals and 1 Day Introductory Schools. Question concerning single length irons such as Sterling Irons as how they relate to single plane swing? Would you recommend them? Good question. We are in the process of researching more about Single Length Clubs and have not found a solution to that topic as of now. In order to get the proper Single Plane alignment, the clubs have to be fit properly in regards to the length and lie angle of the clubs. I started using the single plane swing last September (2015). The reason I did was that I noticed that when I had a “hanging lie” with the ball below my feet, I was forced to extend both of my arms in a manner that approximates the single plane set-up and would hit it at least a club or two longer than normal and straight. It was about that time I received the first Single Plane e-mail. As soon as I watched the first “down-the-line” videos of Moe, I had that aha moment. I started out a 4 and was creeping up. Last update my index was at 1.8 and on the way down. Last weekend I went 73-69. I haven’t cracked 70 in a few years. But, I’ve also worked hard at it. Grip / address, PVC drill, putting fundamentals, multi-club short-game. Oh, I forgot to tell you…I’m 64. This is a great story! Love hearing about your journey with the Single Plane Swing! To be shooting those scores, you have to put work into it. It really shows you that if a person follows along and goes step by step and does things correctly, there is a 100% guarantee that they will get better and become a player that they never thought possible. to play a round of golf and he was struggling with his drives using the traditional 2 plane swing. I asked him to try the single plane swing. I showed him the setup and correct ball position. the middle of the fairway and every drive afterwards was long and straight! I think we have another believer in the Single Plane Swing!! Great to hear and that really shows how Simple the swing is! We would love to see you both in the future! Keep having fun! With a standard grip size, with a hand measurement of 8 1/2, the wraps would be a +6/+4 or +7/+5. Meaning, 6 wraps under the trail hand and 4 wraps under the lead hand. Since the golf pride midsize grips are +4, you would just add 2 wraps underneath the trail hand to make it a +6/+4. I have had the old Natural Golf video and DVD series from the early 2000’s. Tried it back then and it worked for me on the range for a few days, then I started hitting inconsistent shots and went back to conventional golf. Started playing again this year after about ten years and became frustrated with my poor ball striking and watched the old series again and started hitting balls on the range with improved success. Have actually played a few rounds now and can see improved shot making. I have a question about the right foot and “facing the ball” at impact. Do you consciously keep your right foot down at impact and face the ball, or is that supposed to happen automatically? I notice in the videos that Moe keeps his right foot down through impact. Again. Is this on purpose, or a byproduct? Thanks. Great to hear you have come back to the Single Plane Swing! One thing to know is that if you are swinging like Moe, you will get Moe-like results. If the results are not there, the technique needs some work. There is always a reason why something is happening and that is we are here to help you. There are multiple reasons why we want the trail foot on the ground through impact and past impact. Most importantly, it allows the pelvis to stay in position so the spine can stay in posture. Furthermore, studies have shown that it accommodates the proper sequencing (the slowing down of the pelvis so the torso, arms, and hands can speed up). Please put me on your list – thanks! I have sent your information to Tim and he will get you on the list. What can we help you with? Feel free to email me at chandlerr@moenormangolf.com with any questions you have. Yes, you can still learn the swing without attending a School. The first thing I would do is get involved with our Coaching Program to where you can send us videos of your swing for our Coach’s to analyze. This is our best Program for feedback other than coming to a School. The second thing I would do is learn our material because once you know the fundamentals and what to look for, you can start to teach yourself with mirror or video feedback. I pratice Single Plane Swing those couple of days and feel so amazing of the result. Almost everyball fly out in straight way and no more fat strike . Hope can find your coach in China. Hi, I am french Canadian 54 y.o. golfing for 4 years now, and Learning single plane slowly.I noticed good improvements with hybrid clubs and irons, but for the driver, it’s just horrible… no distance,no accuracy, slice the ball most of the time. Can you tell me why I am good with hybrids & irons, but so bad with driver ? I just bought the Single Plane Gold Swing Book and started practicing the Single plane swing. I am 33 years old and have been golfing for 10 years now and have always suffered from inconsistent ball striking (thin/fat shots, and slices with driver). Since reading the book I have noticed some improvements (I can no longer slice the ball if I tried, but I can pull/hook on my miss) and would like to get some lessons. I live in Hamilton, Ontario, Canada, just 45 minutes from Moes hometown of Kitchener. Are there any instructors in the area? I will be sending you a personal email shortly! I have just purchased the SPS and am looking forward to getting into it. I think I know the answer before I ask the question, do you have any SPS schools in the UK? Great to hear from you and glad you have started on your own Path to Success with your Single Plane Swing. The 1st step is getting the Single Plane Solution and begin to learn what we do and how we simplify not only the golf swing, but the golf game. Another big key to understand is how the short game (putting, chipping, pitching) directly relates to the full swing. We’d love to help! We have Schools all over the country and also an online Coaching Program available. Best way to get started is by getting our Single Plane Solution DVD so that you can learn all about the Single Plane Swing. Once you have done so, you will begin to receive the first 5 steps! We have many ways to help you learn Moe’s swing. The best way is to come to a School to speed up the learning process. The next best thing is our Gold Membership to where you can send us videos of your technique whenever you want for ideal feedback. Feel free to give us a call at (405)250-6960 and we can walk you through the proper steps for you!